NETGEAR Genie is a friendly networking tool that makes it easy to analyze and monitor your network. The application shows a graph of your Internet traffic which includes both download and upload. While it’s running, it also provides you with a list of all your installed applications that are currently active and connected to the Internet. You can view their current and total download and upload speeds which makes it easy to find the program that might take up a lot of bandwidth. With NETGEAR Genie you can also manage Wi-Fi connections and customize your router’s settings, assuming you fill in the correct administrator login credentials. The application creates a network map that shows the names of all connected computers along with relevant details such as IP address, connection type, MAC address and status. 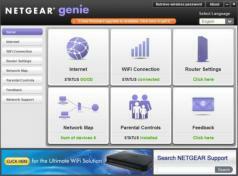 You can even set NETGEAR Genie to notify you when a new device is connected to the network. Also, the program bundles parental control capabilities and allows you to convert a regular printer into an AirPrint compatible printer so you can print documents wirelessly from your iOS devices.